Sponsors - Welcome to the MadSci Solar Car Team! The James Madison Solar Racing Team is an organization which depends on donations to make this project possible. Team members help raise money but donations make the program possible. Through outreach events and the nationally recognized Solar Car Challenge, the team effectively gets their sponsor's names out to the public. When the MadSCI team is invited to an outreach event, sponsors are displayed on both the car and the trailer. With a substantial donation, the MadSCI Solar Racing Team would be happy to come to a company event to illustrate one of the ways you have supported renewable energy. The team would like to thank all of our sponsors without whom there would not be a James Madison Solar Racing Team. Thank you for your time and consideration! The Texas Sustainable Energy Research Institute was created to develop citizen leaders for the global community committed to transform the energy future of San Antonio, Texas and the nation. The Institute integrates scientific discovery, engineering innovation and policy deliberations with pragmatic implementation and a commitment to our multicultural traditions to realize the promise of tomorrow's America as a global energy leader. This program provides opportunities to develop novel approaches to technology insertion, policy formulation and community interactions to ultimately reduce energy costs, improve systems reliability and assure responsible environmental stewardship. The Institute also serves as a center of intellectual creativity that promotes socioeconomic development regionally, nationally and globally. TSERI strives to become an integrating force that connects our faculty, staff and students from across the University and each of its colleges, institutes and centers to other institutions of learning at both higher and secondary levels, for the purpose of addressing the most pressing energy challenges of our time. It was with this goal in mind that the Institute welcomed the sponsorship of the James Madison High School Solar Car Initiative. Toyota’s truck plant in San Antonio is donating to the MadSCI Solar Car Team at Madison High School for their development of a solar car. Toyota Texas is committed to being a good steward of the environment and to supporting young people and education in the San Antonio area, plant spokesman Craig Mullenbach said. "Without Toyota’s help, projects like the solar car wouldn’t be possible" - Madison High School instructor Dr. Joe Dungan said. Cutting, Bending and Packaging with Tomorrow's Technology- Today. Madison graduate Chris Jones laser cut our sproket perfectly- for free. Thank you Mr. Jones for your kind contribution! ...is located in San Antonio, TX. 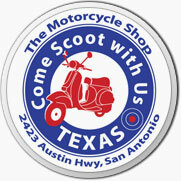 They carry many brands of scooters & motorcycles and provide maintenance and repair services. This business gave us ideas and advice, which we very much appreciate! They donated us blinkers, other odds and ends and also let Sarah have a motorcycle license plate that was laying around. This company donated money and got us the MPPT at cost, which was a great help, given that power trackers can cost you an arm and a leg. Check out their company at http://www.aaasolartexas.com/default.html !